^ "Happy Feet (2006)". Rotten Tomatoes. Retrieved 13 November 2010. 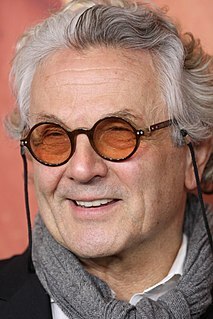 George Miller AO is an Australian filmmaker and former physician. He is best known for his Mad Max franchise, with The Road Warrior and Fury Road being hailed as amongst the greatest action films of all time. Aside from the Mad Max films, Miller has been involved in a wide range of projects. These include the Academy Award-winning Babe and Happy Feet film series. Elijah Jordan Wood is an American actor, film producer, and DJ. He is known for portraying Frodo Baggins in the Lord of the Rings film trilogy (2001–2003). Bolt is a 2008 American computer animated comedy-adventure film produced by Walt Disney Animation Studios and released by Walt Disney Pictures. It is the 48th Disney animated feature film. Directed by Chris Williams and Byron Howard, the film stars the voices of John Travolta, Miley Cyrus, Malcolm McDowell, Diedrich Bader, Nick Swardson, Greg Germann, Susie Essman and Mark Walton. 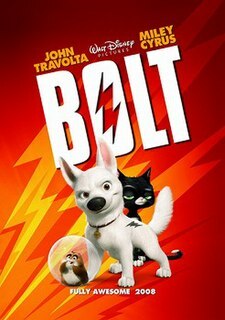 The film's plot centers on a white dog named Bolt who, having spent his entire life on the set of a television series, thinks that he has super powers. When he believes that his human, Penny, has been kidnapped, he sets out on a cross-country journey to "rescue" her. 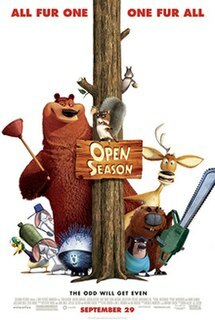 Open Season is a 2006 American computer-animated comedy film directed by Jill Culton, Roger Allers, and Anthony Stacchi, and written by Steve Bencich and Ron J. Friedman. It follows Boog, a domestic bear that teams up with a one-antlered deer named Elliot and other woodland animals to defeat human hunters. The film stars the voices of Martin Lawrence, Ashton Kutcher, Gary Sinise, Debra Messing, Billy Connolly, Jon Favreau, Georgia Engel, Jane Krakowski, Gordon Tootoosis, and Patrick Warburton. The Ant Bully is a 2006 American computer-animated adventure fantasy comedy film written and directed by John A. Davis and based on the 1999 children's book of the same name by John Nickle. Starring the voices of Zach Tyler Eisen, Julia Roberts, Nicolas Cage, Meryl Streep and Paul Giamatti, the film was produced by Tom Hanks and Gary Goetzman's Playtone, Davis and Keith Alcorn's DNA Productions and Legendary Pictures as its first animated film, and distributed by Warner Bros. Pictures. Madagascar is a 2005 American computer-animated adventure comedy film produced by DreamWorks Animation and distributed by DreamWorks Pictures. It was directed by Eric Darnell and Tom McGrath from a screenplay by Mark Burton, Billy Frolick, Darnell, and McGrath, and features the voices of Ben Stiller, Chris Rock, David Schwimmer, and Jada Pinkett Smith, with Sacha Baron Cohen, Cedric the Entertainer, and Andy Richter voicing secondary characters. The film's plot revolves on four animals from the Central Park Zoo who unexpectedly find themselves stranded on the island of Madagascar, and must learn to adapt to the wild. How to Train Your Dragon is a 2010 American computer-animated action fantasy film loosely based on the 2003 book of the same name by British author Cressida Cowell, produced by DreamWorks Animation and distributed by Paramount Pictures. The film was directed by Chris Sanders and Dean DeBlois from a screenplay by Will Davies, Sanders, and DeBlois, and stars the voices of Jay Baruchel, Gerard Butler, Craig Ferguson, America Ferrera, Jonah Hill, Christopher Mintz-Plasse, T. J. Miller, and Kristen Wiig. The story takes place in a mythical Viking world where a young Viking teenager named Hiccup aspires to follow his tribe's tradition of becoming a dragon slayer. After finally capturing his first dragon, and with his chance at last of gaining the tribe's acceptance, he finds that he no longer wants to kill the dragon and instead befriends it. Legend of the Guardians: The Owls of Ga'Hoole is a 2010 American-Australian 3D computer-animated fantasy-adventure film based on the Guardians of Ga'Hoole series by Kathryn Lasky. Zack Snyder directed the film as an animation debut, Zareh Nalbandian produced the film, John Orloff and Emil Stern wrote the film, with Jim Sturgess, Hugo Weaving, Joel Edgerton, Abbie Cornish, Geoffrey Rush, Emily Barclay, Sam Neill, Miriam Margoyles, Helen Mirren, Ryan Kwanten, Anthony LaPaglia, David Wenham and Richard Roxburgh voicing the characters set in a world populated by anthropomorphic owls and other animals. The score was composed by David Hirschfelder and Adam Young from Owl City. Production took place in Australia, and the film was released in RealD 3D and IMAX 3D on September 24, 2010. The film grossed $140.1 million on an $80 million budget. 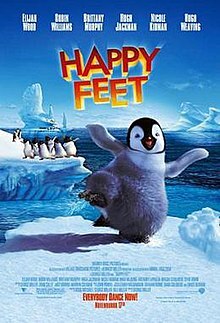 Happy Feet Two is a 2011 computer-animated musical comedy film directed, produced and co-written by George Miller. It is the sequel to the 2006 film Happy Feet, and features an ensemble voice cast that includes Ava Acres, Elijah Wood, Hank Azaria, Robin Williams, Sofia Vergara, Alecia Moore, Meibh Campbell, Lil' P-Nut, Brad Pitt, Matt Damon, Common, Hugo Weaving, Richard Carter, Magda Szubanski, and Anthony LaPaglia. In this movie, Erik, the son of Mumble and Gloria, must stop the Apocalypse from bringing over Antarctica. Storks is a 2016 American computer-animated adventure comedy film produced by the Warner Animation Group and distributed by Warner Bros. Pictures. It was directed by Nicholas Stoller and Doug Sweetland, written by Stoller and stars the voices of Andy Samberg, Katie Crown, Kelsey Grammer, Jennifer Aniston, Ty Burrell, Keegan-Michael Key, Jordan Peele, Stephen Kramer Glickman, and Danny Trejo.